7.8 Earthquake hits the Bonin Islands off Japan. The earthquake shook buildings in Tokyo and temporary closed both runways at Narita Airport. Train service between Tokyo and Osaka was halted due to a power outage. A tsunami warning has not been issued, the earthquake was too deep. There were no immediate reports of significant damage or injuries, though the Tokyo Fire Department had received calls of people suffering injuries through falls. 6.2 Earthquake hits the issue Islands off Japan. 5.1 Earthquake hits the Biak region, Indonesia. 5.0 Earthquake hits the Bougainville region,Indonesia. Tropical Storm Andres is located about 710 mi…1145 km SW of the southern tip of Baja California with maximum sustained winds…105 mph…165 km/h. Present movement…NW or 305 degrees at 7 mph…11 km/h. Hazards affecting land – none. Invest 93E forms in the eastern Pacific as an area of disturbed weather which has the potential for tropical development. Texas, USA – President Barack Obama has signed a disaster declaration for Texas following recent flooding in the area. At least 28 people have died after historic week of flooding in Texas. More than 4,000 structures have been damaged by floods in Houston since Monday that hit the fourth-biggest U.S. city. Storms dumped seven inches on Austin on Monday and as much as 11 inches overnight on Monday in the Houston area. On 22 May 2015, the National IHR Focal Point of Qatar notified WHO of 1 additional case of Middle East respiratory syndrome coronavirus (MERS-CoV) infection. Between 26 and 29 May 2015, the National IHR Focal Point of the Republic of Korea notified WHO of additional confirmed cases of Middle East Respiratory Syndrome Coronavirus (MERS-CoV). This DON describes the 8 additional cases and provides an update on the 3 cases of MERS-CoV infection reported in a previous DON on 24 May. On 30 May 2015, the National IHR Focal Point of the Republic of Korea notified WHO of an additional confirmed case of Middle East Respiratory Syndrome Coronavirus (MERS-CoV). On 29 May 2015, the National Health and Family Planning Commission (NHFPC) of China notified WHO of one confirmed case of Middle East Respiratory Syndrome Coronavirus (MERS-CoV). Kuchinoerabu-jima (Ryukyu Islands): So far, the volcano has remained calm so far, although a new explosion remains a possibility and the highest alert level 5 (evacuation) remains in place. All islanders have been evacuated and there are no reports of fatalities. The Japanese Meteorogical Agency (JMA) believes that the eruption, which occurred at 09:59 local time, was phreatomagmatic in origin. A local earthquake occurred just under a minute before the explosion. The height of the eruption plume was given as 9 km. The pyroclastic flow that traveled northwest from the vent reached the western shore near the Pink Beach area, next to the harbour. 5.1 Earthquake hits the Alaska Peninsula. 5.0 Earthquake hits southern Qinghai, China. Tropical Storm Andres is located about 720 mi…1155 km SSW of the southern tip of Baja California with maximum sustained winds…90 mph…150 km/h. Present movement…NW or 325 degrees at 7 mph…11 km/h. Hazards affecting land – none. So much ice has been lost due to recent accelerated melting of the Antarctic that scientists have detected small changes in Earth’s gravity field as a result. 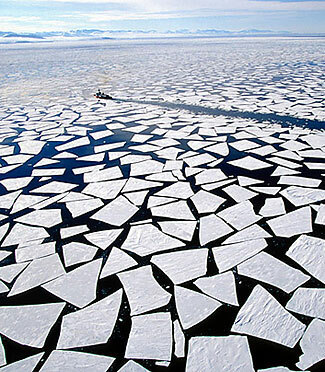 The melt has been especially pronounced on the Antarctic Peninsula, which had shown no signs of change until 2009. But several glaciers there have started to shed their ice since that time, dumping about 14.5 trillion gallons of water into the Southern Ocean each year. “To date, the glaciers have added roughly 300 cubic km (72 cubic miles) of water to the ocean. That’s the equivalent of the volume of nearly 350,000 Empire State Buildings combined,” said Bristol University researcher Bert Wouters. The changes were measured by using data from the CryoSat-2 orbiter, a mission of the European Space Agency. A sudden and massive ice melt in a previously stable region of Antarctica has caused changes in the gravity field of Earth. 6.9 Earthquake hits the Alaska Peninsula. The Pacific Tsunami Warning Centre said that based on its available data, no tsunami was expected. The USGS said the quake was unlikely to cause casualties and notable damage, and there were no immediate reports of such. 5.3 Earthquake hits southeast of Easter Island. 5.2 Earthquake hits Atacama, Chile. Tropical Storm Andres is located about about 795 mi…1285 km SSW of the southern tip of Baja California with maximum sustained winds…70 mph…110 km/h. Present movement…WNW or 295 degrees at 9 mph…15 km/h. The week’s hottest temperature was 120.6 degrees Fahrenheit (49.2 degrees Celsius) at Nawabshah, Pakistan. The week’s coldest temperature was minus 112.2 degrees Fahrenheit (minus 80.1 degrees Celsius) at Russia’s Vostok Antarctic research station. Scientists say they have found a way to treat and protect bats from a deadly fungus that has killed an estimated 5.7 million of them in the United States and Canada over the past seven years. Many caves in eastern parts of both countries have experienced a 78 to 100 percent reduction in the number of bats since white-nose syndrome emerged. 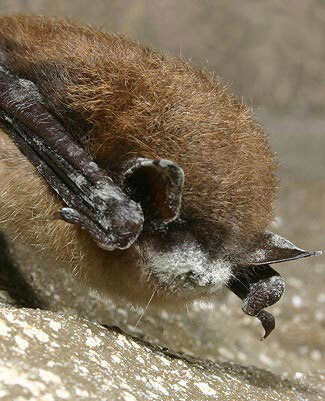 The fungus interrupts the bats’ winter hibernation, causing them to starve to death. But researchers have found a common soil bacteria, Rhodococcus rhodochrous, appears to inhibit the growth of the cold-loving fungus. They conducted experiments last fall in which diseased bats were treated with compounds produced by the bacteria. Many of the treated bats survived the winter and experienced improvements in their health. Scientists say the results are promising, but caution that more research is needed. Biologists have released bats that had white-nose syndrome last fall but were successfully treated during a field trial over the past winter. Health authorities in Sierra Leone`s Kono district have confirmed an outbreak of Measles in the area. According to reports Thursday, the World Health Organization have dispatched emergency support and have engaged local health personnel in training to face a new threat mostly dangerous to children. Kono was declared a “Measles Positive District” following test of 21 samples which turned back five positive cases, said Sahr Amara Moiba, Kono District Disease Surveillance Officer, Ministry of Health and Sanitation (MoHS). The disease was confirmed in seven out of fourteen chiefdoms in the district – Fiama, Nimikoro, Nimiyama, Gorama Kono, Sandor, Tankoro and Gbense – Moiba said. 98% of the cases are children between zero and one year, he added. Kuchinoerabu-jima (Ryukyu Islands): Two people have been reported injured, presumably burnt by pyroclastic surge, and were flown to a hospital in Yakushima island. So far, it is not clear whether the eruption is a large-scale phreatic (steam-explosion driven) event or caused by new magma. Ash analysis should bring light into this soon. A powerful vulcanian explosion occurred this morning at 11:02 am local time at the volcano. The eruption – a both vertical and partially lateral massive explosion, occurred with apparently little warning from the Shintake vent and produced large pyroclastic flows by column collapse. A tall mushroom ash plume quickly rose to approx. 12 km altitude (36,000 ft). JMA raised the alert level to the highest (5 out of 5) and authorities ordered immediate evacuation of the 130 inhabitants. Preliminary reports say that no fatalities or significant damage occurred, although this seems almost too good to be true, judging from the view of a massive pyroclastic flow that swept down to the coast near the port of the small island. Sakurajima (Kyushu, Japan): After having been comparably calm the past days, the volcano started a series of strong explosions this morning. Ash plumes rose to reported 14,20,000 ft altitude. The eruptions were followed by long phases of mild to moderate, continuous jets of ash. Wolf (Galápagos Islands, Ecuador): During the evening of 27 May (local time), the lava flow entered the sea on the southeast shore of the northern part of Isabela island. No Magnitude 5+ earthquakes so far today. Tropical Depression 1E (the first tropical depression of the eastern Pacific hurricane season) is located about 685 mi…1105 km SW of Manzanillo Mexico with maximum sustained winds…35 mph…55 km/h. Present movement…WNW or 295 degrees at 15 mph…24 km/h. 91E and newly formed Invest 92E are areas of disturbed weather in the eastern Pacific with potential for tropical development. Texas, Ohlohoma, Mexico (Update)- The widespread flooding caused by heavy rains in Texas and Oklahoma have now left 18 dead and 40 missing or unaccounted for, in addition to more than 4,000 damaged properties and 2,500 abandoned vehicles in the Houston area alone. Storms dumped record rainfall on the Plains and Midwest, caused major flooding and spawned tornadoes, including one twister that killed at least 13 people in the Mexican border city of Ciudad Acuna.